Note: Good Karma Bikes has now moved to its new location at 460 Lincoln Avenue. The retail space reopens today at 2:00pm and they are once again accepting bicycle donations, so if you have a gently used bike (that isn’t from Walmart, Target or some other big box store) please donate - and like Good Karma Bikes on Facebook. I was fortunate to meet a fellow named Alex at the recent Cargo Bike Festival in San Jose. I also met his organization, Box Bike Collective, and his signature product that he welds himself right here in California. I’m also fortunate that I have a chance to review this handmade cargo bike in great detail: It is about eight feet long and, unlike anything I’ve ever pedaled in my life, has the cargo box in in the front. These bikes are not uncommon in Europe but aren’t seen too frequently in the U.S. That’s unfortunate because, right out of the gate, this is what it means to not only #choosethebike but choosing not to own a second car - or even a first car. I know I’m not alone in feeling like California (and most of the U.S. for that matter) deliberately arranges itself so that every adult must have their own car. But most trips are less than two miles from the home and if you can carry a lot of things with a bike (I do have a long and happy history with saluting the cargo bike) it’s all the more reason to use one. 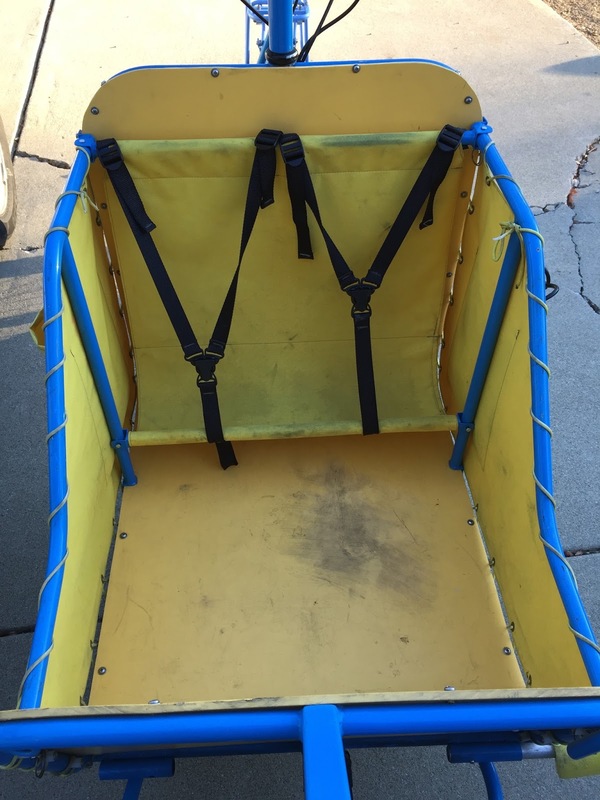 Now the Box Bike has a child’s seat that allows two kids to sit side by side. I’ve seen people - including, of course, Emily Finch - do this. Having a child or even two isn’t necessarily a one-way ticket to Minivan-ville if you opt for a Box Bike. 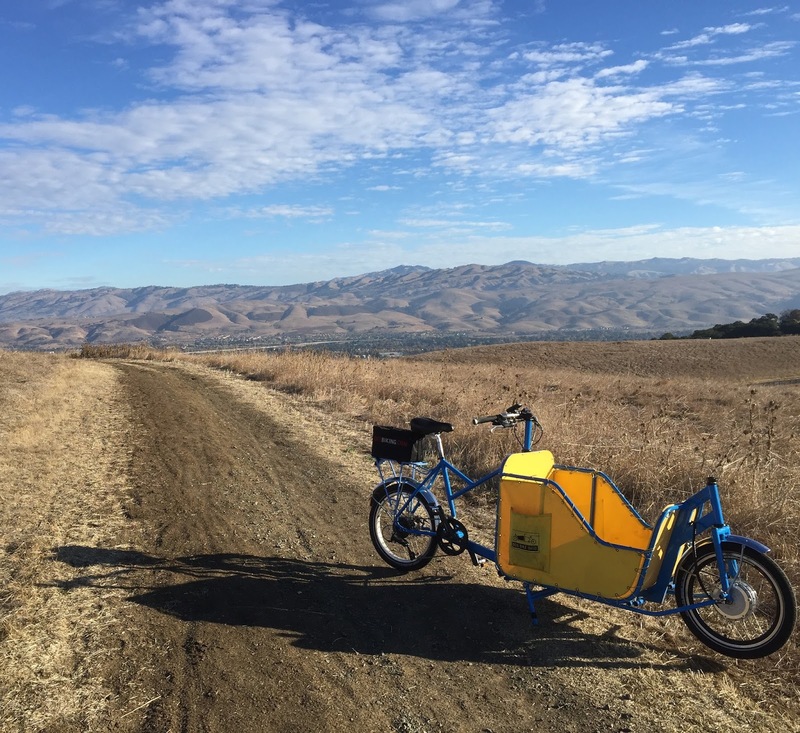 And as I began riding this bike (and, yes, getting used to the linkage steering) I began to ask how do we want to show our children the world? 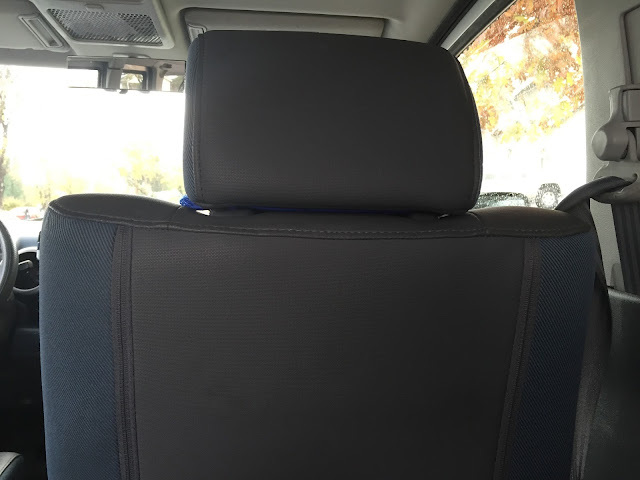 And that view is rather generous when you consider the growing number of kids who are using their parent’s old iPads in the car with the vacant, 1,000 millimeter stare that is too common with today’s youth. 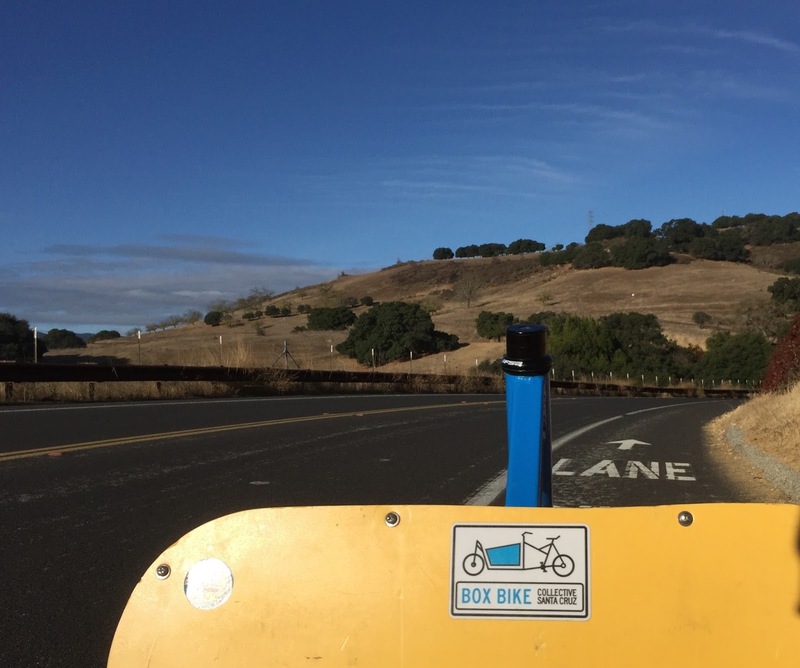 In Box Bike, they actually see something other than a tiny screen or the back of a car seat. I also got to thinking that if enough people move their children around with bikes then, in the future, the kids will be less likely to see smog in the air and asthma inhalers in their hands. So that’s just something to think about as I put this bike through more paces, which I am doing all week. 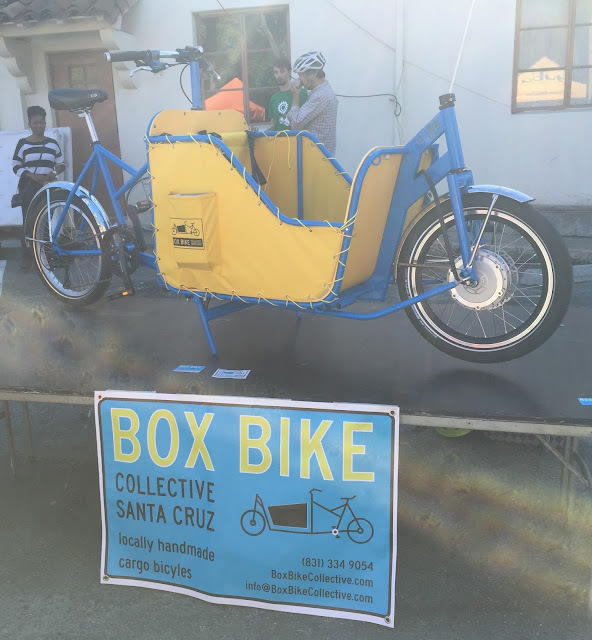 For more information about Box Bike Collective, visit their website, and remember: Good Karma Bikes is reopening today and is again accepting donations. Today, remember to #choosethebike....and, while we're at it, choose to avoid stupid red cup controversies by going to a local coffee shop - like Lorca in Stamford or Moonbeans in San Jose - instead of a national chain. Thanks for reading and thanks for riding. There is a silver cylinder on the platform before the cargo area. Is that a coffee thermos? If so, very cool!!! Judging by the front hub, I'd say that's the battery. Tony is right - it is the battery - but like jpr3 I first thought it was a Thermos too. 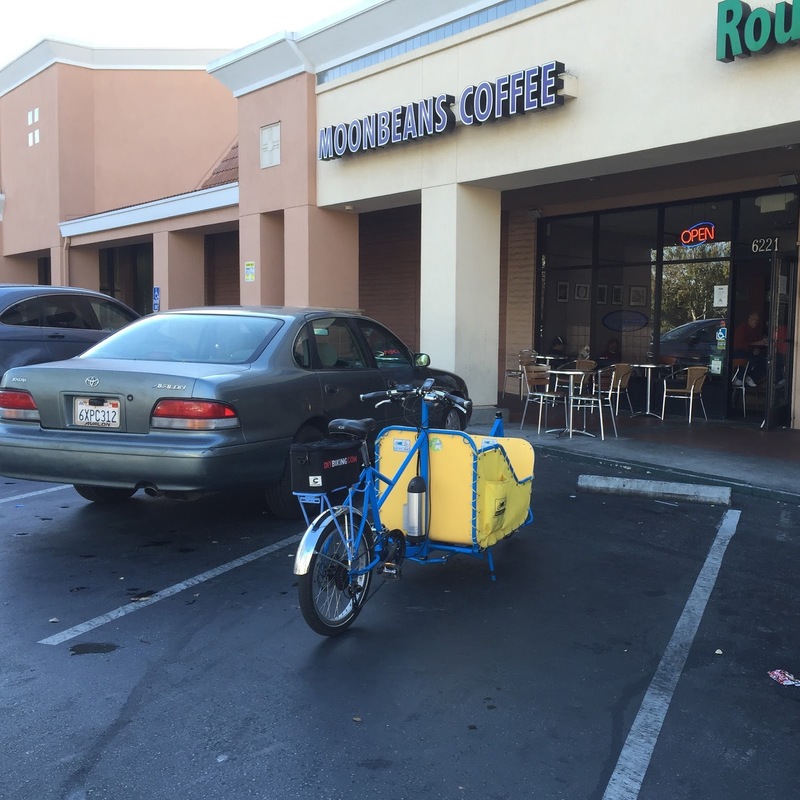 @jpr3 and Mike: I believe a Coffee Cafe-themed Box Bike is in the works --check out the web page to get the latest! @michaelknorris: Great and thoughtful post about BBC --Alex is genuinely changing it up on the roads, a couple of wheels at a time.